Renfe-SNCF en Cooperación was born as an association of European High Speed specialists RENFE and SNCF, with the goal of commercializing train routes between Spain and France. In the beginning of 2014, the company renewed its digital identity by launching a new website. At the same time, it introduced a complete multichannel strategy in its most prominent markets, Spain and France, in order to gain online reputation and importance, which it was in need of at the time. Once the goal had been achieved, from 2015 onwards, it began progressively offering its services to new international markets. It was Cyberclick who took the lead on this project from the very beginning, through different actions promoting online presence and customer acquisition. Cyberclick’s first move to optimize the position of the new website was an audit. A detailed report was prepared in which the different actions to improve the SEO were proposed. A top-to-bottom strategy was adopted, as optimization was initiated on the home page with more generic keywords. Later, complementary pages were used to optimize other word combinations, following specific pages of each category, and finally the lower-level pages were worked on with more specific long tail keywords. Changes began to be noticed, and the different factors influencing positioning were placed on a constant and monthly monitoring system. The organic positioning was secured as the second source of website visitor arrivals during 2015, with over 800 pages indexed by Google and over 100 keywords in the TOP 10. One of the most important of Renfe-SNCF en Cooperación’s goals, in Spain and France alike, was to attract traffic to their website. In order to do so, Cyberclick proposed the initiation of a continuous Content Advertising campaign. Through this channel, we were able to not only generate website traffic, but also other positive medium-term effects are also felt from this type of advertising, such as the strengthening of the brand’s reputation and increase in direct searches. In summary, very useful insights are gathered concerning what content generates most interest and influences users to position the brand as an “expert” in High Speed, as well as its routes. Relevant content related to Renfe-SNCF and its destination began to be created on a regular basis, which since then have also served to enrich the company’s blog, within its website. Through a Content Advertising platform, these contents are shown in diverse journals and online publications as recommended reading. 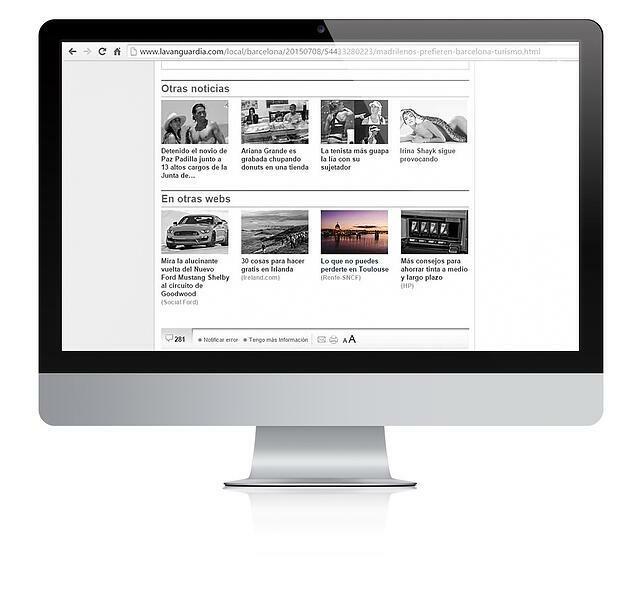 The network of publishers includes reference websites such as La Vanguardia and El País in Spain, or Le Figaro and Le Monde in France. In this way, any user who may find themselves in one of these sources would have the opportunity to access Renfe-SNCF’s content on its own website, after having been introduced as “Related Articles” to what they were reading. 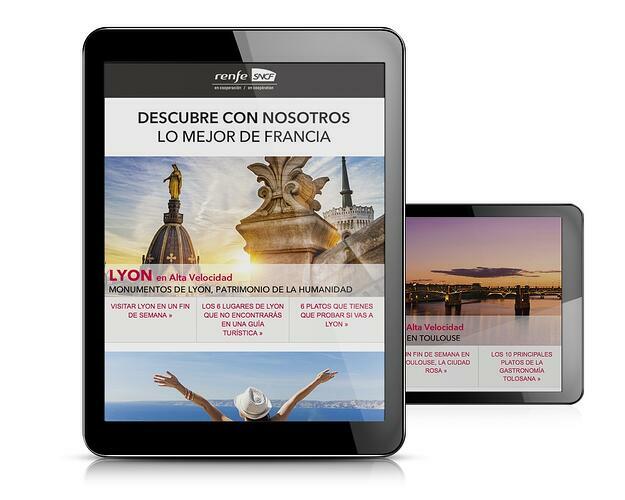 At the moment, the Content Advertising campaigns in France and Spain contribute around 20% of Renfe-SNCF en Cooperación’s website vists, and more than 85% of the new users who discover the brand every month. The average click ratio of the articles is around 0.10% in France and 0.15% in Spain. Of all content that has been created until now, the articles that tend to attract most attention in the French Market are those related to beaches (about Costa Brava for example) or about gastronomy. In the Spanish market on the other hand, there is a preference for content regarding destinations with historical attractions (medieval or roman like Carcassonne and Nîmes), along with Paris. In order for Renfe-SNCF en Cooperación’s new digital identity to work on a global level, it had to be present on the main social networks. In this sense, corporate profiles on Facebook, Twitter, Google+ and Youtube were created and energized, both in France and Spain. On some of these networks, such as Facebook, a quite significant community was generated in a short period of time, thanks to Like acquisition efforts with giveaways as incentives. The prizes were train tickets with hotel accommodation included, to Renfe-SNCF’s destinations. Since 2014 all social media profiles have been gradually growing, with the help of other types of campaigns such as in-profile games or promoted posts. Between the different social networks Renfe-SNCF is present on at the moment, there are more than over 17,000 followers/fans. Through promoted posts on the brand’s social networks, namely Facebook and Twitter, we impacted over 1,000,000 users monthly in each country. 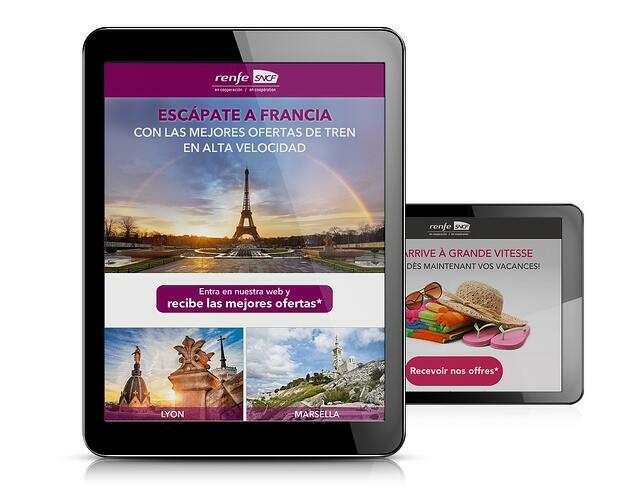 In both France and Spain we were able to attract from 10,000 to 20,000 monthly visits to Renfe-SNCF’s website. In order to create a personal database, registration acquisitions were focused on since the beginning of the collaboration, through recurring Email Marketing campaigns with a click-to-lead model. These types of actions invite users to subscribe to Renfe-SNCF’s newsletter in order to stay up to date with what’s happening, while redirecting them to the webpage with the brand’s current offers and promotions. Furthermore, this type of web traffic is of very high quality in terms of time spent on the page ratios regarding both ticket searches and reservations. Thanks to the emails sent inviting receivers to subscribe to Renfe-SNCF’s newsletter, a database with over 100,000 users was generated. After registration, users recurrently received communications on behalf of the brand. The traffic coming from this channel is very reactive. The bounce rate of users on the website is under 10% and the average duration of sessions is over 2 minutes. The opening rate of this campaign’s emails is around 15-20% in Spain and 10% in France. The CTR, which is equivalent to the conversion to lead ratio due to the acquiring model used, is on average 7% in Spain and 5% in France. The eCpm’s obtained by the different databases as a result of the actions taken, a vital metric for the continuity of acquisition, stand out significantly in every email sent. Alongside diverse actions of more permanent nature, a series of promotional initiatives were also communicated. Some via branding campaigns, aimed at specific targets in relation to events taking place in the destinations, or related to corporative actions. Others quite reputable for their performance were more linked to offers related to prices. A good example of campaigns oriented towards brand image, is one that was dedicated to the Spanish market in June 2015, with the purpose of generating awareness towards Renfe-SNCF’s destinations. In order to do this, several articles were written about the destinations that were being promoted and incorporated into the client’s blog. These articles were spread via two channels: Content Advertising and Email Marketing. The former was able to attract significant volume of visitors interested in the content about the destinations. With the latter, emails were sent containing several articles and databases with users interested in travel. Approximately 10% of the users who opened the email clicked on the articles, and consequently arrived at Renfe-SNCF’s blog where they could then navigate and access more content. As for the promotional campaigns, it is important to mention the “Flash Sale” which took place in Spain in January 2016, consisting of a special price to travel from Barcelona to Paris, Lyon and Marseille, limited to 5 days. The goal of this promotion was to attract the maximum number of visitors to the Renfe-SNCF website, which would convert to bookings (purchases) in a very short period of time. To this end, resources were invested in Email marketing, Display marketing and Social Networks (with promoted posts), which were able to achieve the maximum amplification within the first 2 days of the promotion. The campaign with the objective of promoting secondary destinations in France was able to, in less than a month, attract over 100,000 visits to the articles on the Renfe-SNCF blog, written especially for this objective. The most popular articles were those related to the city of Toulouse: “A weekend in Toulouse, the pink city” and “The 10 main dishes of Toulouse’s Gastronomy”, responsible for 53% of the campaign’s total visits. With January 2016’s Flash Sale, more than 17 million users were impacted, directing 170,000 visitors to the website in a space of 5 days. 7% of these people researched the availability of trains, and 17% of the sales made with the Flash Sale were due to Cyberclick’s online campaigns. Furthermore, over 15,000 new users were acquired for Renfe-SNCFs database. 6. Inaugurate the online presence in new international markets: United States, United Kingdom, China, Japan, Australia, India and Arab Emirates. Beyond strengthening the online presence of Renfe-SNCF en Cooperación in Spain and France, the next and most recent objective is to expand said presence to other international markets. Starting with the United Sates and United Kingdom during 2015, and following with countries such as China, Japan, Australia, India or Arab Emirates since the beginning of 2016. Using the English version of the Renfe-SNCF blog as a landing page, articles linking the destinations in France and Spain are being developed, attracting the interest of future tourists who are contemplating the possibility of travelling by train between the two countries. Various Content Advertising campaigns have been activated, which since then have been raising awareness for the brand around the world. The campaigns are being constantly optimized to gain increasingly more relevance in the countries, which according to the metrics, show most interest in Renfe-SNCF. At the moment, these markets are the United Kingdom (with CTRs of approximately 0.18%), followed by Argentina and Japan (with CTRs of 0.15%) and Australia ( with CTRs of 0.10%). In these countries, articles such as “France and Spain have never been so close!” and “The easiest way to travel between the two top visited cities in Europe” were those that stood out most. At the end of 2015 the traffic originating in international markets already represented 18% of the total amount of visitors to the Renfe-SNCF website and is still rising, with new user ratios of over 90%.